Stephanie Train is part of a facilitation team that leads a creative writing workshop for incarcerated women at the Larimer County Detention Center in Fort Collins, Colorado. Stephanie has been involved in the SpeakOut! program since spring 2008. Every Wednesday night she looks forward to sharing her writing space with the detained women who courageously pour their souls onto the page. Kayla Parry is an undergraduate English major who has been co-facilitating weekly writing workshops at a residential facility for at-risk youth since early 2009. She enjoys helping the young men and women disseminate their powerful and necessary words among the community. Tobi Jacobi is an assistant professor in the English Department at Colorado State University and the director of the Community Literacy Center. She has been working with incarcerated women writers and training SpeakOut workshop facilitators in an effort to situate literacy education as a tool for social change since 2000. The SpeakOut! writing workshops were established in 2005 as a collaboration between the English Department at Colorado State University and local justice and recovery facilitates in Fort Collins, Colorado. Each week, SpeakOut! workshop leaders facilitate ninety minute writing sessions with adult and youth writers at four sites and focus on introducing issues of writing identity, genre, style, and technique. The workshops are run twice annually in twelve-week sessions that align approximately with the academic calendar and culminate with a celebration and the publication of the SpeakOut! Journal, a set of creative and expository writings that distributed to the writers and across the region. In the reflection that follows, two SpeakOut! workshop facilitators reflect on our workshop structure, curriculum design, and the emergence of powerful stories of experience. Stephanie: Each Wednesday, we bring a loosely themed lesson plan into the workshop. Sometimes we focus on the craft of writing, utilizing prompts that help teach specific poetic/narrative forms. Other times we will focus on a cultural or sociological theme such as body image, gender/cultural studies. We usually like to warm up with free writing exercises; the writers turn off their internal editors and write uncensored for a set amount of time. Then we move into the writing prompts. Kayla: It is most helpful to get the girls focused on group by beginning with a warm-up poem or two. I usually always try to pick something that I know will catch their attention and help them transition from their leisure time that precedes group. We like to focus on themes, and each one must be something that will interest a group of teenage girls. It’s something that sometimes proves difficult toward the end of their stressful days. A memorable theme that my co-facilitator brought was poems and writing on beauty, a concept that can be difficult to overcome socially and culturally for girls of their age. The conversation and writing from that day proved exceptional because they had much to think about and say on the issue. We also mold many of our prompts in poetry from other poems we read in group. 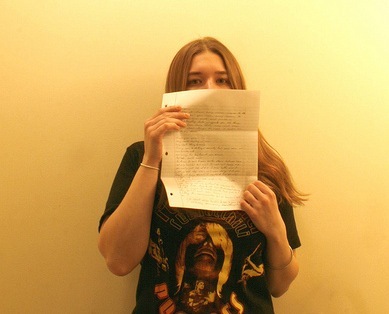 Stephanie: One of the most successful prompts we have in the workshop is a “letter to my younger self.” The writers have produced some amazing, powerful, intense writing. Some write about regret and poor choices in the past, but many address their younger selves in a loving, nurturing manner. “Love yourself,” “believe in yourself,” are common phrases found in the writer’s work. Olivia Cummings is a 2009 graduate of Smith College and a research intern at the Prison Policy Initiative. Most recently she co-authored a report with Peter Wagner on prison-based gerrymandering in Maryland. Olivia will begin a Ph.D. program in history in the fall. The non-profit, non-partisan Prison Policy Initiative documents the impact of mass incarceration on individuals, communities, and the national welfare. PPI is most famous for documenting the distortion in our democratic process caused by the Census Bureau counting people where they are confined, not where they come from. 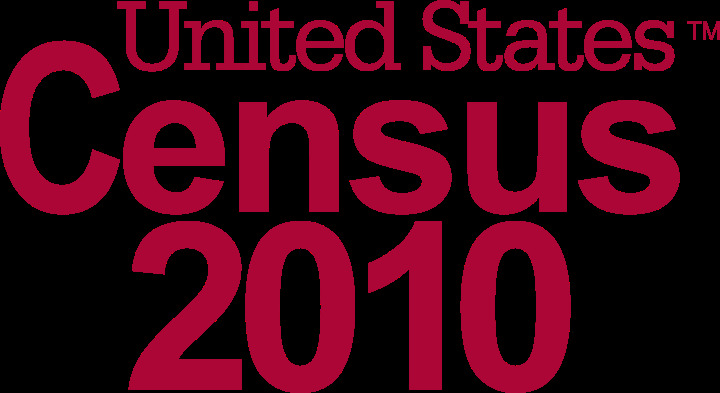 In less than a month, the Census Bureau will collect population data across the country that will be used to adjust legislative districts in accordance with the Supreme Court’s “One Person One Vote” rule. In Massachusetts, the Census Bureau counts prisoners as residents of the towns in which they are incarcerated, even though they cannot vote and remain legal residents of the places they lived prior to their incarceration. State and local governments use the Census to apportion political power on the basis of equally sized legislative districts. Crediting thousands of disenfranchised people, a disproportionate number of whom are urban men of color, to other communities, the majority of which are non-urban and white, has staggering implications for American democracy. Inaccurate population data undermines the democratic process and the constitutional guarantee of equal access to political representation. What does this mean for state and local government in Massachusetts? In Massachusetts, a State House of Representatives district is supposed to contain 39,682 people, plus or minus 1,984 people. The legislative commission that drew Massachusetts’ districts in 2001 met the federal standard of population equality only because it included prisoners in the overall population count. Five House districts do not meet federal minimum requirements without the prison populations. District 37 in Middlesex County deviates from federal requirements by -5.48%, District 9 in Norfolk County deviates by -5.68%, District 14 in Worcester County deviates by -6.4%, District 7 in Hampden County deviates by 8.06%, and District 3 in Suffolk County deviates by 8.2%. This means that approximately 95 people who reside in a prison district carry as much political power in the State House of Representatives as 100 residents elsewhere. These legislative districts lack sufficient population to meet accepted “One Person One Vote” standards without counting disenfranchised prisoners as part of their population base. Massachusetts’ decision to rely on flawed Census counts of the prison population artificially enhances the representation afforded to districts with prisons and dilutes the voting power of everyone else. Winter Elliott is an Associate Professor of English at Brenau University, an institution composed of an historic women’s college and a coeducational undergraduate college. She teaches courses in composition and British lit, and enjoys the saucier side of literature — murder, mayhem, monsters, and the war between the sexes. At first it seems like a clear cut case of right and wrong: a husband is murdered in his sleep, strangled to death by a rope around his neck. His wife, who appears all “done up” to the man who discovers the victim, pleats her apron and laughs crazily. Her alibi, if it can be called that, is so asinine as to be ludicrous: she didn’t wake up from a sound sleep while the deed was done, and in modern parlance, some other dude did it! While the facts of the murder seem obvious, two decent, otherwise law-abiding housewives eventually decide to hide the evidence of the wife’s motive – and whether or not justice will be done is left unclear. This murder mystery is the subject of Susan Glaspell’s 1916 play Trifles, which she renamed “A Jury of Her Peers,” when she published it a year later as a short story. In some ways, the title of the short story better indicates Glaspell’s point. Even the passage of the Nineteenth Amendment in 1920 did not immediately give women the universal right to serve on juries. Thus, Glaspell implies that the two housewives in the play or short story are more truly the “peers” of the murderer, Minnie Wright, than would be an all-male jury. Consequently, as Mrs. Wright’s peers, the two women, Mrs. Hale and Mrs. Peters, uncover evidence of Minnie’s long-term abuse and decide to hide the strangled canary that both represents Minnie herself and provides evidence of her motive – she strangled her husband as both she and her pet had been, figuratively and literally, strangled by him. 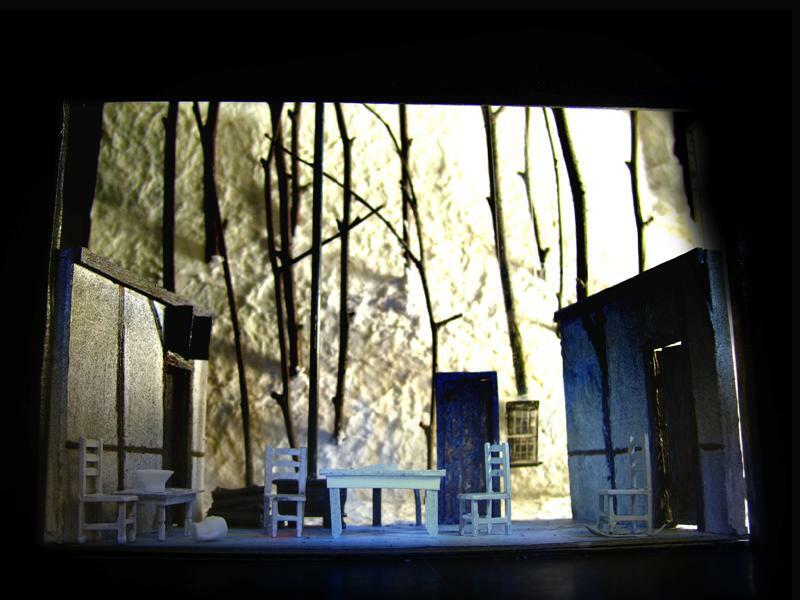 A one-act play, simple in terms of plot, characterization, and symbolism, Trifles is a frequent inclusion in college literature anthologies and on syllabi of writing about literature courses. In this context, my students encounter the ethical dilemma suggested by the play. As students at a women’s college, one might expect, as one of my students herself put it, that all or most of the young women would immediately side with Minnie Wright and her female supporters in the play. This is not the case. Students who read Trifles for the first time usually position themselves alongside the male representatives of “law and order” in the play, the sheriff and country attorney. Like these men, students first encountering the play don’t really care why Minnie Wright killed her husband; they perceive only a crime that must be punished – regardless of the status of either the victim or the murderer. Beth Ayer is a graduate student in the Professional Writing program at UMass Dartmouth, and the web editor for Changing Lives, Changing Minds. 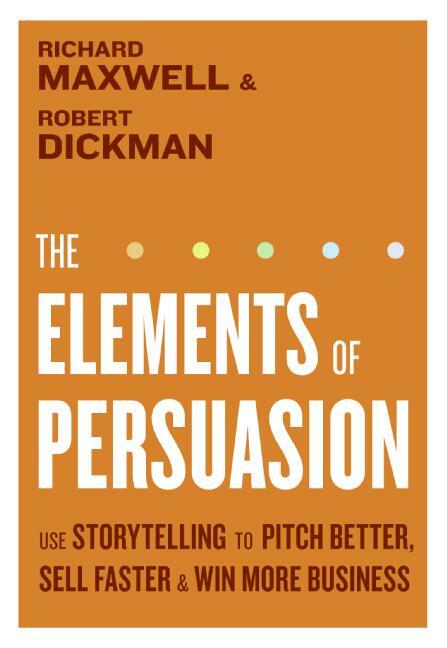 The Elements of Persuasion aims to teach readers how to tell stories in order to “have control over [their] own work and ideas.” This book is banned with thousands of others with little explanation, according to a recent article published by the Austin American-Statesman. All successful stories have five basic components: the passion with which the story is told, a hero who leads us through the story and allows us to see it through his or her eyes, an antagonist or obstacle that the hero must overcome, a moment of awareness that allows the hero to prevail, and the transformation in the hero and in the world that naturally results. The components of great stories, as described by Maxwell and Dickman, have unlimited potential to positively impact readers. Does being empowering qualify a book for banning? Tam Lin Neville is the author of the full-length book of poems, Journey Cake (BkMk Press, l998). Her second collection, Triage, is forthcoming from Cervena Barva Press. Her poems and reviews have appeared in Harvard Review, Mademoiselle, American Poetry Review, Ironwood, and Threepenny Review. Co-editor of Off The Grid Press, she also works for Changing Lives Through Literature as teacher and administrative assistant. I know that my title is an oxymoron, but I wrote it this way because many of my most memorable reading experiences have come when I was traveling, free of all daily encumbrances. Here is one particular scene: The month was December; I was traveling by bus from NYC to a small town in upstate NY where my family lived. The bus, luckily, was actually three hours late due to snow that began in Albany. I was rereading one of my favorite childhood books, The Secret Garden by Francis Hodgson Burnett. Because of the delay, I was able to read the whole story in one sitting, turning the last page just as the bus pulled into Keene Valley’s one gas station, the local Greyhound stop in that small Adirondack town. On that bus ride, while reading The Secret Garden, I was able to exchange one world for another. 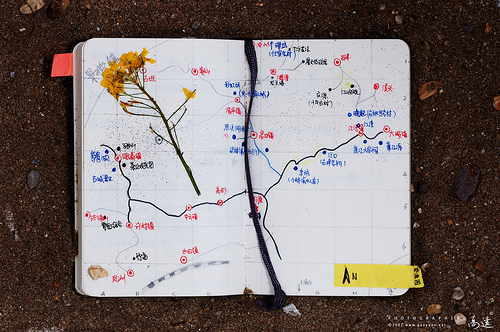 Instead of the musty, lived-in air of the bus, I found myself in an enclosed, overgrown garden, where the air was fresh and cool in early spring. “It was the sweetest, most mysterious-looking place anyone could imagine. The high walls which shut it in were covered with the leafless stems of roses which were so thick that they matted together . . . .No wonder it’s still, Mary whispered, I am the first person who has spoken in here for ten years. I fell headlong into the garden’s dark history and then slowly, the brighter story that comes to replace it. This is what I call “deep reading.” For reasons too mysterious to analyze, you find yourself lost for hours, deeply embedded in another time and place. My particular experience of deep reading, “on the wing,” is like travel within travel.